She was a friend to many in the early music world (including us); this week, music from her last projects with the Medieval Women’s Choir and Shira Kammen. Margaretha E. Tindemans was born March 26, 1951, in Nederweert, the Netherlands, the fourth child of Wilhelmina Coenen and Henricus Tindemans. She died December 31, 2014, in Seattle. Margriet’s childhood in post-World War II Europe, in the village where she was born, grounded her in the values that defined her life. Her father was an elementary school teacher at a time when his pupils often showed up hungry or cold. Her mother taught “domestic arts,” grew the family’s vegetables, took outcasts of various stripes into their home, and found ways to support her children’s talents as soon as they emerged. Music was Margriet’s talent from early on. She remembers tapping her toes inside her shoes to the rhythm of kyries and swaying in her pew as the priest droned. She began violin lessons at age ten. By age 14, she was named first violin in the National Youth Orchestra of the Netherlands. The group gave concerts throughout Holland-“our postage stamp of a country,” she called it. Traveling with the youth orchestra developed Margriet’s taste for communal music-making. After Conservatory studies in Maastricht, then Brussels, Belgium, and Basel, Switzerland, which she completed with highest honors, her virtuosity led to an international career as a renowned performer and teacher of early music. At various stages in her career she performed on and taught, among other instruments, recorder, harp, mandolin, viola da gamba, vielle (medieval fiddle), and baroque viola. For over a decade Margriet was a member of the distinguished early music group Sequentia, performing throughout Europe and North and South America, India, Asia, and Africa. In addition to Sequentia, Margriet has performed with, among other groups, the Royal Dutch Opera, the Newberry Consort, King’s Noyse, Seattle Baroque Orchestra, Pacific MusicWorks, Gallery Concerts, and the Folger Consort. She was from the beginning in 1980 one of the pillars of the “Oude Muzick Festival” in Utrecht, the Netherlands, which has grown into a world-renowned center of early music. Her performance of the Cantigas of Alfonso el Sabio was the official gift of Queen Beatrix of the Netherlands on the occasion of a state visit to Denmark. Margriet has recorded for Harmonia Mundi, Erato, Wildboar, Musica Omnia, and others. Her recording of Handel arias with Lorraine Hunt Lieberson and Stephen Stubbs was nominated for a Grammy Award in 2006. After she moved to Seattle in 1986, from Cologne, Margriet was named Artist in Residence at the University of Washington and became active in the Early Music Guild. In an EMG Discovery Series performance for children in 2009, she invited small hands to examine her collection of medieval fiddles, then juggled bananas and oranges: a squealingly successful finale. For eight years she served as music director of puppet operas at the Northwest Puppet Center, including performances of Don Giovanni, The Dragon of Whatley, and The Magic Flute. More recently, she joined the music faculty at the Cornish College of the Arts. In 1990 Margriet taught medieval chant and other early music forms to a group of twelve women, through the Northwest Center for Early Music Studies. The group eventually expanded to 60 and became the Medieval Women’s Choir, a non-audition performing ensemble now in its 25th season. Open to women of all levels of musical skill, the MWC is Margriet’s proudest accomplishment and the dearest to her heart. Her friend and colleague Nancy Zylstra will take over directing the remaining two performances of the Choir’s 2014-15 season, including a multimedia show of Cantigas de Santa Maria in March 2015 and a semi-staged performance of Hildegard of Bingen’s Ordo Virtutum in May 2015. 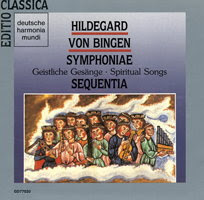 I. Hildegard von Bingen: Symphoniae (Sequentia). DHN CD CDC 7 49251-2. II. Laude Novella: Music of the Italian Middle Ages (Medieval Women’s Choir/Margriet Tindemans). MWC 602. III. The Dawn of Joy: Songs and Dances of 14th Century Italy (Shira Kammen/Margriet Tindemans/Peter Maund). "Chominciamento di gioia", or "The Dawn of Joy", is the title of a dance from a collection of medieval instrumental pieces in what is known (quite prosaically) as British Library, Additional 29987. This manuscript, now in London, contains 119 compositions, all by composers of the Italian Trecento. Among the best known today are Francesco Landini, Niccoló da Perugia, and Jacopo da Bologna. The instrumental works in the manuscript are grouped together and consist of several Istanpitte, Salterelli, and other dances. All have intriguing names, such as the title dance of our CD. Another memorable title, Principio de Virtu, might refer to a connection of the manuscript with the Visconti family in Milan: Gian Galeazzo Visconti was known as the Count of Virtú. The Istanpitta, or Estampie, is the only medieval dance form for which descriptions as well as music have survived. Each phrase, or punctum, in an estampie is repeated. A refrain of differing length is inserted after each iteration of a phrase, alternating open and closed endings. The Salterello follows the same principle but tends to be shorter and less complicated in character. It is quite extraordinary that these dances were written down at all, since we know that the players of these pieces, known as minstrels or jongleurs, mostly improvised their art. Successful minstrels needed a tinker's bagful of talents. According to Guiraut de Calançon (Fadet Joglar), they were expected to play at least nine instruments, have a knack for storytelling and songwriting, sing, improvise dances, juggle, perform magic tricks, demonstrate acrobatic skills, catch little apples on knives, imitate birdsong, jump through four hoops, and, if possible, dance with bears! Although playing for dancers would have been an important part of the professional musicians' job, they didn't hesitate to play vocal works. They made their own arrangements or improvised on songs their audiences knew. Even in church this practice was not unknown: the famous hymn Ave maris stella served as the base for a highly ornamented version in the Faenza Codex, a 15th-century manuscript containing instrumental arrangements of mostly 14th-century vocal polyphony. Women played instruments, as amateurs and as professionals. Francesco da Barberino, in his Reggimento e costumi di donna, a 14th-c. treatise on the education of young women, states that they should learn to play instruments, especially the vielle and the harp; they should know how to sing and compose text and music and be able to perform these songs, accompanying themselves. In Boccaccio's Decameron female musicians outnumber the male players. Margriet's childhood in post-World War II Europe, in the village where she was born, grounded her in the values that defined her life. Her father was an elementary school teacher at a time when his pupils often showed up hungry or cold. Her mother taught "domestic arts," grew the family's vegetables, took outcasts of various stripes into their home, and found ways to support her children's talents as soon as they emerged. Music was Margriet's talent from early on. She remembers tapping her toes inside her shoes to the rhythm of kyries and swaying in her pew as the priest droned. She began violin lessons at age ten. By age 14, she was named first violin in the National Youth Orchestra of the Netherlands. The group gave concerts throughout Holland-"our postage stamp of a country," she called it. Traveling with the youth orchestra developed Margriet's taste for communal music-making. After Conservatory studies in Maastricht, then Brussels, Belgium, and Basel, Switzerland, which she completed with highest honors, her virtuosity led to an international career as a renowned performer and teacher of early music. At various stages in her career she performed on and taught, among other instruments, recorder, harp, mandolin, viola da gamba, vielle (medieval fiddle), and baroque viola. For over a decade Margriet was a member of the distinguished early music group Sequentia, performing throughout Europe and North and South America, India, Asia, and Africa. In addition to Sequentia, Margriet has performed with, among other groups, the Royal Dutch Opera, the Newberry Consort, King's Noyse, Seattle Baroque Orchestra, Pacific MusicWorks, Gallery Concerts, and the Folger Consort. She was from the beginning in 1980 one of the pillars of the "Oude Muzick Festival" in Utrecht, the Netherlands, which has grown into a world-renowned center of early music. Her performance of the Cantigas of Alfonso el Sabio was the official gift of Queen Beatrix of the Netherlands on the occasion of a state visit to Denmark. In 1990 Margriet taught medieval chant and other early music forms to a group of twelve women, through the Northwest Center for Early Music Studies. The group eventually expanded to 60 and became the Medieval Women's Choir, a non-audition performing ensemble now in its 25th season. Open to women of all levels of musical skill, the MWC is Margriet's proudest accomplishment and the dearest to her heart. Her friend and colleague Nancy Zylstra will take over directing the remaining two performances of the Choir's 2014-15 season, including a multimedia show of Cantigas de Santa Maria in March 2015 and a semi-staged performance of Hildegard of Bingen's Ordo Virtutum in May 2015. [...which] has opened new worlds of beauty and history" to her audiences and students. The Mayor's proclamation describes her as "a towering musical artist, mentor, and leader, beloved and admired by a wide community." Margriet is survived by her spouse, Judith Suther of Seattle; her sisters Jeanne Tindemans and Annemiek Tindemans and her brothers Peter Tindemans and Jan Tindemans, all of the Netherlands; her nephews Simon Tindemans of England, Arthur Tindemans and Bas Mulders, both of the Netherlands; her nieces Mirjam Mulders of the Netherlands and Ingrid Mulders of England, and all their partners; her great-niece, Nisha Tindemans of England; and her all-time best student and musical soulmate, Shira Kammen of Berkeley, California. Margriet was preceded in death by her parents and her late husband, Richard Templeton. Margaretha E. Tindemans (1951-2014), Shira Kammen, Peter Maund, Francesco Landini, Niccoló da Perugia, Jacopo da Bologna.